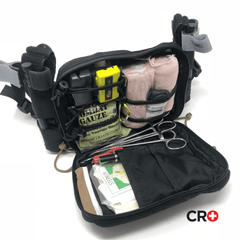 Spread-load your consumables and plus up your capabilities with our scalable Ankle Individual First Aid Kit. Wear it over your combat pants on a raid force or during mounted operations... (works better if you don't walk through wadis with it). 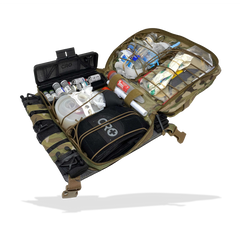 Or, if you wear a suit to work, this is a great option to bring a REAL medical capability to the fight- designed to work with a CAT Gen 7. For all those that roll with SOFTT-W's, we got you, the tuck tab allows you to use that tourniquet as well. 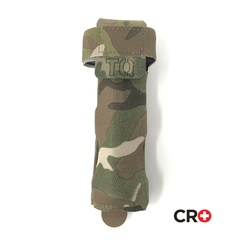 We hate saying it, but if you require an extremely low-vis setup (skinny jeans or something), then an elastic tq will fit. The TQ cover is designed to ride on the achilles to flex naturally with your stride and is by far the most comfortable ankle rig ever made. Signature laser-cut, four-finger handle (easy access, throw across the room, lay next to a patient's head to direct someone to run a MARCH. Elastic retention for all of your MARCH supplies. CAT Gen 7 Tourniquet cover- able to be tucked for use with any tourniquet. 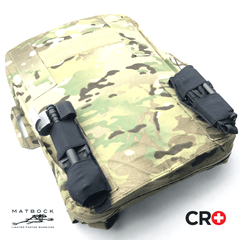 Chest seals can fit into the velcro pocket. This is our first release, also comes in black. Made from squadron laminate. 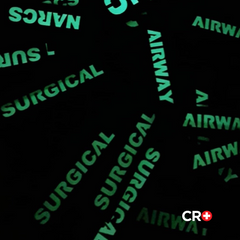 Comes with purchase of the CRO Medic System.